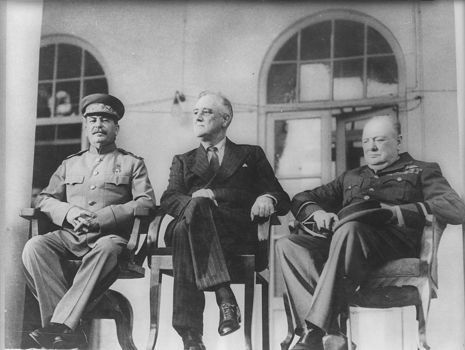 The first of only two wartime meetings between the three leaders, the Tehran Conference opened with Stalin brimming with confidence after several major victories on the Eastern Front. Opening the meeting, Roosevelt and Churchill sought to ensure Soviet cooperation in achieving the Allies' war policies. Stalin was willing to comply, however he demanded Allied support for his government and the partisans in Yugoslavia, as well as border adjustments in Poland. Agreeing to Stalin's demands, the meeting moved onto the planning of Operation Overlord (D-Day) and the opening of a second front in Western Europe. 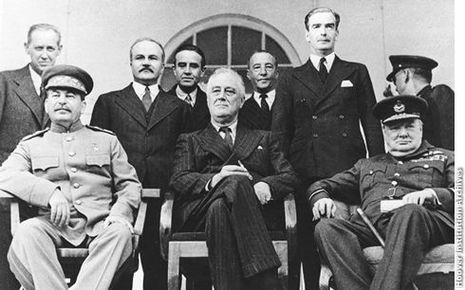 From the memoirs published by those who took part in the negotiations in Tehran, it would appear that Stalin dominated the conference. Alan Brook, chief of the British General Staff, was later to say: "I rapidly grew to appreciate the fact that he had a military brain of the very highest calibre. Never once in any of his statements did he make any strategic error, nor did he ever fail to appreciate all the implications of a situation with a quick and unerring eye. In this respect he stood out compared with Roosevelt and Churchill." In return for America’s help in defeating Germany on the eastern front, Stalin promised to help the United States win its war against Japan. The meeting was so friendly that Churchill later expressed unease at Roosevelt’s extraordinary effort to charm and accommodate Stalin. Churchill would have preferred an indirect assault on Germany to Overlord, and mistrusted the Soviet leader. For his part, Stalin wanted a territorial buffer between the Soviet Union and Germany, made up of the former Baltic nations, Poland and part of Germany, to be part of any post-war peace settlement. The most important Allied conference of the war was held in Tehran, Iran between 28 November and 1 December. Churchill, Roosevelt and Stalin met together for the very first time, and key issues like the future shape of Poland and Germany were discussed.